Humans Can Have With New Ideas Without Input - Fact or Myth? Humans can have new ideas without drawing from past experience. Can People Have New Ideas? Humans can’t have new ideas without prior sensory input. We copy, transform, and combine old ideas to create new ones. This impacts the way we collaborate and our culture. Let’s look at the neuroscience and logic that shows us what ideas are, how creativity works, and why it’s interesting. In other words, speaking loosely, “there are no new ideas” just copies, transformations, and combinations based on what we perceive from others, the world around us, or from our own transformations, combinations, and relations of ideas. If you consider the act of creating new mashups of old ideas to be “having new ideas”, then we can say “people can have new ideas” in this way. If you consider things more broadly however, no person brought up in any society can remove themselves from their past experience, thus our “new ideas” are always going to be an advent of copying, transforming, and combining old ideas gleaned from sensory input. Basic reason can help to show the logic behind that, the way our memory works proves the rest. Thus, this is partly just an issue of reason and semantics, but also party a statement on how our neurology works. What is creativity? This really amazing PBS video on creativity explains the concepts on this page at about the 6:00 mark. NEW IDEA: “Life is a remix, a mash-up, a revision, a reboot. You are the DJ”. In one sense, there are no new ideas, just new ways to copy, transform, and combine old ones. An organic fast food chain, an APP that lets you create APPs that lets you to create APPs, the chords for Louie Louie, the baseline to Under Pressure, explaining the Laws of Motion and Special Relativity, etc. Putting a new twist on an old idea could be a unique masterwork, but be wary of the fine line between innovation and plagiarism, and don’t discount multiple discovery or the inherent connection between individualism and collectivism. 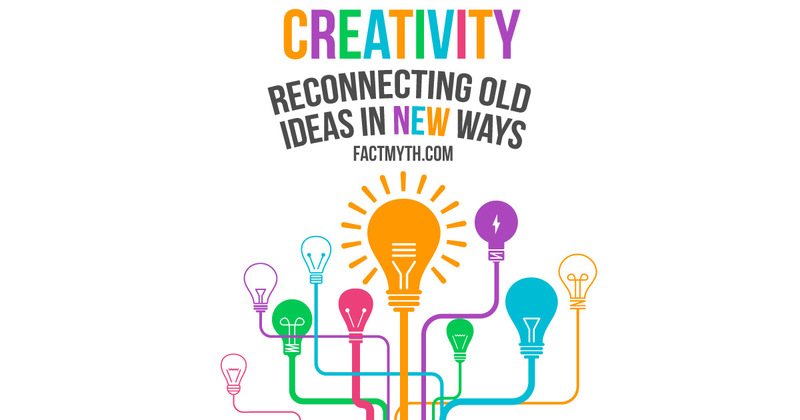 Creative thinking, or creativity, is the “creative” reconnecting of old ideas in new unique ways (creatively copying, transforming, and combining). Creativity isn’t our ability to invent new ideas out of thin air with no previous input, it’s our ability to take what we already know, draw new connections, and then express that. We can copy other people’s ideas, we can transform other people’s ideas, or we can combine different ideas into new ones. The process is complex, involves utilizing many different thinking types, and many different parts of the brain. Generally, creativity involves one the main functions of the brain including, sensing our environment, focusing our attention, and the storing and recalling of memories. We look at some of the details related to creativity and “having new ideas” below. GENERAL ADVICE: One must always be the first, the best, or have great marketing. A video looking at the way that the brain reacts to things like improvisation. Basic functions aside, your brain starts as a relatively clean state as far as ideas go. As we take in sensory input from the world around us, we record sensory information as memories in our neurons. When we access two or more neurons at once synaptic pathways are created between them. Creating new connections between existing neurons in different parts of our brains, and utilizing a number of cognitive functions, results in what we call “having new ideas” or “being creative”. When we call on stored sensory inputs in our memory with our attention (conscious or subconscious) we activate a number of different parts of our brains (especially for high-level tasks). That said, in regards to creativity, we are mainly accessing the associative “spontaneous” network and the normative “conservative” network. The associative region of our brains comes up with new ways to connect old data while the normative region checks things like social norms and rules. When both areas are functioning concurrently we get creative original ideas. At no point in this process are we pulling ideas out of thin air, every step of the process we are simply combining old elements in unique ways. this is cognition. Be it in a human or a computer, cognition is the mental action or process of acquiring knowledge and understanding through thought, experience, and the senses. Given all the above, in a very real way, from Mozart, to Einstein, to Gates, there are no new ideas just re-mixes of old ones. Ted-Ed looks at a musician’s brain. This is an example how creativity works. Below are the author’s notes, this goes beyond what science knows and focuses on patterns noticed by the author. Think of a new animal that looks nothing like an animal that you have never seen before (no legs, no arms, no faces, just new elements). Draw nothing from past experience and instead create everything from thin air. NOTE: Given your inability to finish step 1 there has been no step 2 constructed for this example. We see the same orks, goblins, dragons, etc Tolkien “created” in nearly every fantasy game on the market. We have X amount of animals on earth and other objects to draw from, and even given this, we can’t seem to stop ourselves from drawing a guy with green skin or a giant lizard. Not exactly creativity at it’s finest. The idea of leveling up didn’t exist until 1972… No one had the idea to create RPGs, experience points, etc. Then Dungeons and Dragons happens, and today it almost feels as we’ve always had RPGs. Have you ever noticed that no one seems to be able to figure something out (like electricity, video games, or the polio vaccine for example) and then almost at once there are multiple discoveries of the same invention? Is this because the ideas needed to bring the creation to life didn’t exist before a point. Then, once those “new ideas” (reconnecting of old ideas) are in the public eye, the last piece of the puzzle is in place for a new invention. This results in “multiple people discovering the same or similar things in and around the same time. A “new” type of music comes out. Now every band sounds like that. Why can’t we stop playing the same chords and riffs? Even bands tend to influence themselves and make “same” sounding songs and records. Someone comes up with a new look. Now everyone looks like that. See the hipster effect. Someone does a study and has a new finding. Now everyone talks about the findings like we have all known forever. Or, worse, an erroneous talking point is spread and everyone believes it as true. Video games keep using the same mechanics over and over again, part of this is building engines is expensive, part of it is the same reason Hollywood uses formulas, part of it is likely just how ideas work. We build a Watson AI just like the movies, Musk plans to go to mars, Apple comes up with a watch, pad, and paper. The list goes on. The things we create are so often similar to that which has come before or exists in nature. The most creative of us make slight variations, but all signs hint to us needing a slightly more complex understanding of “what creativity is” and how the discovery, invention, and the creation of “new ideas” really works. Creativity is a strange beast, but today we have neurosciences to help us understand what is happening. The brain of a free-styling musician who is jamming with a band and improvising with their guitar may be firing on all cylinders, but they are still relying on past experience for new ideas. Simply put, what we think of as “new ideas” is probably better defined as copying, transforming, and combining old ideas. While “being creative” is probably best defined is being good at copying, transforming, and combining. Since there are so many parts of the brain at work, we also have to assume there is a wide range of creativity types needing to be studied. “How Our Brains Work When We Are Creative: The Science of Great Ideas“. 99u.com. Retrieved Feb 3, 2016. “How does our brain form creative and original ideas?“. Sciencedaily.com. Retrieved Feb 3, 2016.